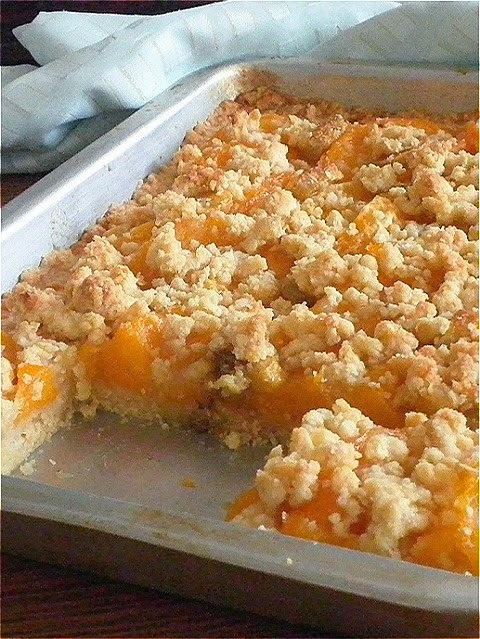 Peach Crumb Slab Pie is a fun way to serve pie like a bar. The crust is rolled to fit a rimmed jelly roll pan and shaped into a rectangle instead of round. You can experiment with other fruits that are available throughout the year. If using fresh fruits add juice of one lemon to avoid browning but now I used canned peaches that have been drained well. We are not adding much sugar to the filling since the peaches are already sweetened. Adding sugar to the crust as well but this is entirely up to your preference. Don't worry if your crust tears while you're rolling it out, just patch it back together. You'll know it's good when you press the dough into ball shape. If it is overly dry, add one tablespoon of ice water at a time. At this point, you can cover and refrigerate it. Whisk flour, rolled oat and sugar in a mixing bowl. Grate the cold butter into dry ingredients using the large holes of box grater. Using /pastry cutter/ mixer or your finger tips, quickly rub in the butter until the mixture resembles bread crumbs. Gradually add a tablespoon of ice water at a time, use your fingers to press the crumbs firmly together to form a ball of dough. Wrap the dough in plastic, chill for 30 minutes-1 hour. 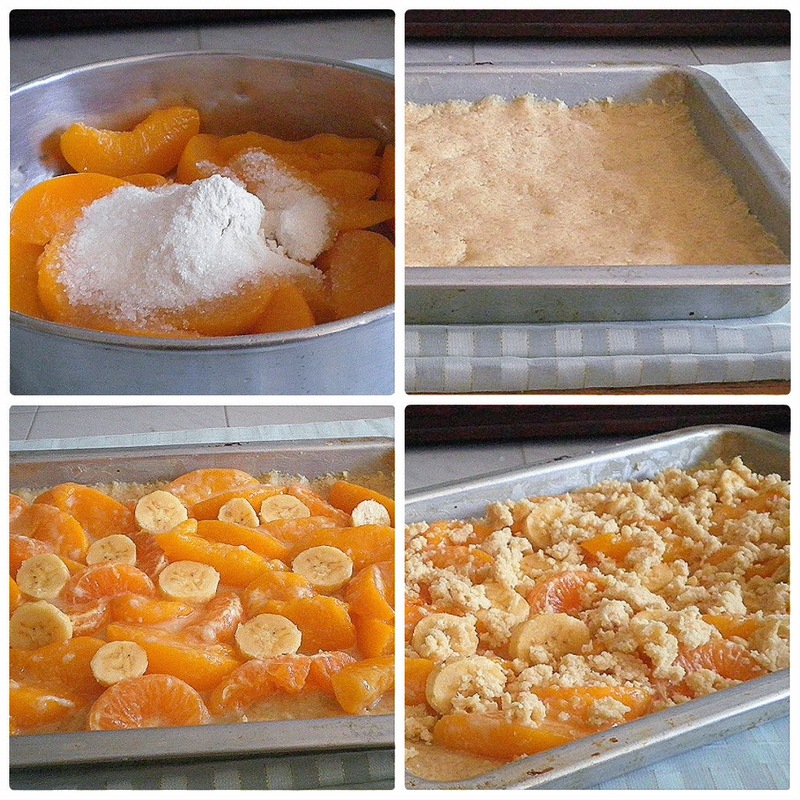 For filling, combine sliced peaches, sugar and flour.. Roll out 2/3 of the pastry on floured board to fit 9 x 13 in jelly roll pan with some overhang. Carefully transfer onto baking sheet, pressing into the corners. Fold dough over to create thicker edge. Heat the oven @ 180 C.
Spoon the filling onto prepared dough.. Crumble the balance of the pastry over the filling. Bake until topping is crisp for 35-45 minutes. Cut into slices to serve. Sooo colorful and mouth-watering dessert!! This looks so yummy! I will have to try it out! Oh wow...what a creative recipe! Looks great! 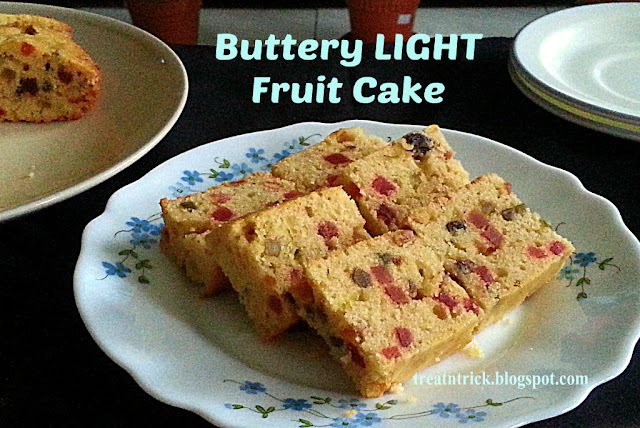 Love desserts with fruit filling and this crust is awesome! This looks so good, I love simple and easy dessert recipes like this, they are always the most delicious! Wish I had some of this with a big scoop of ice-cream with my afternoon tea today!!! Well I would love a slice it looks fantastic - Thanks for linking up to Pin Worthy Wednesday, I have pinned your post to the Pin Worthy Wednesday Pinterest Board. Yummy! Thank you so much for sharing this recipe on the Inspire Me Mondays Link Up. Have a wonderful weekend and we hope to see you back again next week! Wow, this looks delicious! Thanks for adding this fab recipe to Foodie Friday! Yum. Looks delicious. I love easy to make desserts that only look complicated. 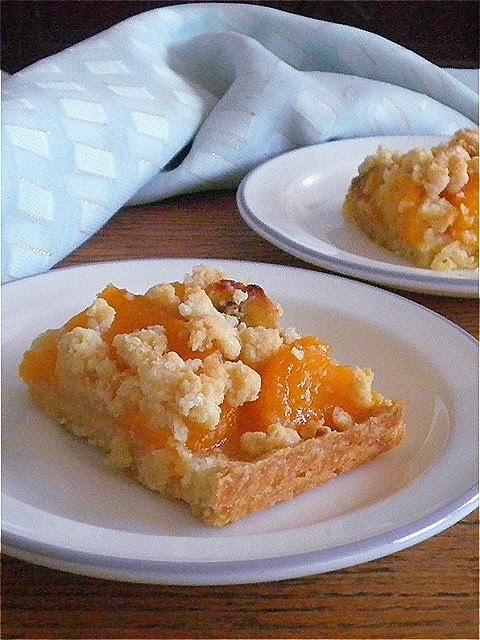 I love anything with a crumb topping :) thanks for sharing with Small Victories Sunday linkup. Pinned to our linkup board. Hope you join us again this weekend. This looks absolutely delicious! Thanks for sharing the recipe and linking it up at This Is How We Roll Thursday. Yum! Thanks so much for sharing with Adorned From Above's Link Party. Please tell me how much butter and size of canned peaches in ounces or cups instead of grams....thanks. Please clarify how much butter and size of can of peaches from grams to ounces or cups. Thanks. Looks delicious! Thanks so much for sharing at my Creative Ways Link Party! I hope you'll be back to share more awesome posts this week! I would eat this the way I love to eat any fruit pies...warm with milk poured over it! YUM! Thanks so much for sharing at Celebrate Your Story!